The venerable John Koukouzelis was a famous Chanter and beautiful sounding musician. All who knew him called him "angel-voiced". He was from Durres and lived in the years of the Komnenoi. Orphaned of his father, he was raised by his pious mother who took care of his education. When he came of age he went to Mount Athos and became a monk in the Cell of the Archangels, which belonged to the Sacred Monastery of Great Lavra, and was one of the two great Chanters of this Monastery. The other was Gregory Domestikos. He reposed in the early fifteenth century and was buried in the Cell where he was a monk. Tradition has preserved some grace-filled incidents from his life that deal with his musical talent. We will record two characteristic examples. 1. When he was out grazing the goats of the Monastery, they returned late in the evening back to the fold almost starved, unlike other times when they were grazed by the other fathers. The Abbot, to ascertain what exactly happened, commissioned a monk to follow John. The monk was stunned by what he saw and literally could not believe his eyes. Once the animals were grazing, Koukouzelis began to chant which caused them to stop eating and listen attentively. When he stopped chanting, they began eating again. When he started again, the animals looked at him as if spellbound listening to his chanting, which was flooded by uncreated Divine Grace. 2. Another time, when he was chanting during an all-night vigil, as soon as he completed the "Axion Esti", he was stunned to see the Panagia in front of him, who thanked him as she put a gold coin in his hand, because he chanted the hymn devoutly and with humility. The Venerable One was not trying to impress by demonstrating his vocal abilities, but he chanted naturally, calmly and he felt the sacred texts in the depths of his soul. He prayed chanting and chanted praying which is why he fascinated listeners, but he also caused their souls to be solemn and and helped them pray. This is very important, because when chanters pray, then they help the people pray. And vice versa. When the congregation participates meaningfully in Worship without making noise, this facilitates in the work of the choirs of chanters, because they are given the opportunity to concentrate within themselves and have their attention focused, with the result that they offer the hymnological texts in the best possible way. But when those who "circle the sacred analogion" are not as careful as they should be, the people will speak to each other even worse and laugh, and instead of creating a solemn atmosphere of prayer, they cause distraction and upset those praying. Thus they not only sin themselves, but they cause others to sin. Great care is required together with a daily struggle against habits, which are deleterious. The ever-memorable Elder Fr. Philotheos Zervakos, wanting to teach the correct way of chanting, brought forward Alexandros Papadiamantis as a model of a humble and prayerful Chanter, whom he called his teacher, because he taught him to chant with humility and fear of God. He admits that before he came to know him, he would chant loudly and proudly. He writes: "Before I went to the vigils and to Papadiamantis ... I knew to chant with pride, to chant loudly so that the entire congregation can hear me, to please them, and for them to praise me, saying: 'Well done, well done, you have a beautiful voice, you chant beautifully.' From Papadiamantis I learned to chant humbly with prudence, awareness and fear, pleasing both God and people." As another one of his contemporaries, Spyros Melas, says, Papadiamantis "chanted without ever having learned music, without learning how to read its notes and almost having no voice. Yet he fascinated everyone in the church, chanting from his soul, giving color to every word, every sentence ... his music was totally internal." 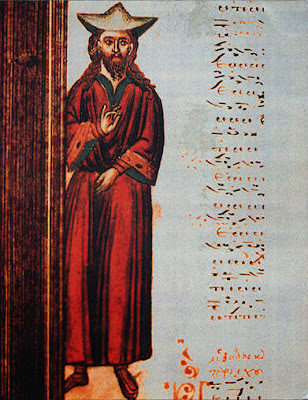 The hymnological texts were written by Saints who were God-seers and they contain all the theology of the Church, which is why when they are chanted correctly, without error and according to the tone, rhythm and meter, they cause solemnity, spiritual sweetness and a prayerful mood for the soul. This takes place, naturally, when it is done with commitment and attention. Unfortunately, many times, during the duration of Divine Worship, the mind goes and wanders here and there, and man, instead of receiving through his prayers grace and blessing, sins with his imagination. The sacred hymnographer highlights this truth and calls for correction in the following hymn, which is a self-rebuke and self-condemnation, as well as a supplication to God for repentance and correction: "Many times while chanting, I am found committing sin, for with my tongue I pronounce songs of praise, yet in my soul I think unseemly things; but correct both Christ God and have mercy on me" (Aposticha of the Praises, Third Tone, Monday morning). This applies, naturally, to all of us and not just the choirs of chanters. Besides, the choirs chant on behalf of all those who participate in Divine Worship. When the human soul is receptive to Divine Grace, then the readings and chants, if read clearly and chanted correctly and befitting sanctity, create devoutness, illumination of the nous and warmth of heart, which give birth to prayer. Then the choir of believers prays chanting and chants praying. Source: Ekklesiastiki Paremvasi, "Ο ΚΑΛΛΙΚΕΛΑΔΟΣ ΨΑΛΤΗΣ ΚΑΙ ΑΓΓΕΛΟΦΩΝΟΣ ΟΣΙΟΣ ΙΩΑΝΝΗΣ Ο ΚΟΥΚΟΥΖΕΛΗΣ", October 2002. Translated by John Sanidopoulos.